Since the club’s formation, around 1,000 players have played for the Baggies. From legends such as Allen, Brown and Astle, to names we would rather forget, this section of Albion Till We Die takes a look at all of them. Offering the most in-depth online player A-Z currently available, as well as sections on internationals, appearances, goalscorers, award winners and the definitive 'where are they now', the Player Archive is the number one resource for Albion players past and present. The Player Archive is a work in progress with many sections still being worked on, but pages will be added regularly. If there's a particular section you would like to see added or if there's a player you require information on, then do feel free to get in touch. Most appearances, debuts, ever-presents, lists, records and more. From Astle to Zuberbuhler, ATWD presents the complete a to z of past and present Baggies. Most goals, hat-tricks, debut goals, fastest goals and more. 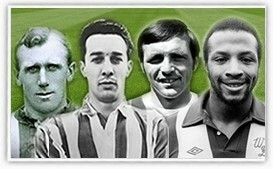 A look at the many players that have over the years represented the Baggies and their country. Who won what and when - A look back at over thirty years of award winners. The whereabouts of over 350 former Albion players and staff in 2016.